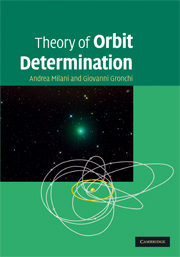 This site contains the additional material, which was not included in the book THEORY OF ORBIT DETERMINATION by A. Milani and G.F. Gronchi, because it would have exceeded the number of pages assigned by the publisher, and anyway the size which is appropriate for most readers. Still, this material, which we have collected in three Appendix chapters, is useful especially when trying to implement in software the algorithms of orbit determination, and can be used for consultation. We will also insert in this site the new results, at least in the form of new references, obtained after the publication of this book. If and when necessary, also errata corrige will be here. The structure of this site is as follows: there is a page for each chapter, containing references to new papers and/or comments, corrections, possibly additional material. Then there are separate pages for each of the appendixes, containing comments and references. The main additional pieces of text are provided as links to separate text files (in PDF format), in such a way that they are suitable to be printed. This site is currently work in progress, that is we are inserting in it material as it is available, sometimes in a preliminary form, e.g., as preprint of a research paper, to be later either replaced or supplemented by a book-style section, even chapter. It is important to stress that the process of update of this book should also be the result of an interaction with the readers. That is, we expect to receive comments, suggested corrections, and requests for clarifications/expansions by our readers, to be sent to our mail adresses, which are: userid milani and gronchi at dm.unipi.it (please note these are not addresses you can click on to send a mail, because experience shows this would be a recipe for spam).